My personal area of expertise is balance of payments analysis—not trade law. For understanding trade law, I rely on the work of others. A trade war is, among other things, a legal process—at least in the United States. Congress has delegated a lot of authority over the regulation of international commerce to the executive branch, which has given the Trump Administration a lot of latitude. But Trump and his team are still working within the framework of U.S. trade law (“232s”, “301s,” “201s,” etc.). And they are not working, rather consciously, fully within the framework of the World Trade Organization. The big cases—the 301 versus China, the (coming?) 232 versus autos—are being pursued through U.S. law, and they will be subject to a challenge in the WTO. An alternative strategy—challenging China in the WTO for violation of its WTO commitments—hasn’t been the administration’s focus. And I think there are three papers that constitute essential reading for understanding the Administration’s choices. The first is Mark Wu’s seminal paper [PDF] outlining why China’s party-state fits poorly within the WTO’s legal restraints. One reason why China now likes the WTO is that it hasn’t significantly constrained China’s industrial policy ambitions (while it does bind the United States to its "bound" tariffs, at least in theory). And one reason why the Trump administration hasn’t pursued China inside the WTO is that many of the policies that concern the U.S. aren’t necessarily WTO violations. The second is Robert Lighthizer’s 2010 testimony [PDF] to the U.S. China Economic and Security Review Commission. It makes for interesting reading today—both for Lighthizer’s specific complaints about how China’s WTO accession was mishandled (I personally agree with his argument that the U.S. should have made more use of “421” special safeguards in the face of the China shock, and done more to counter China’s massive foreign currency intervention) and for the basic strategy he puts forward for responding to what he views as the mistake of letting China into the WTO. He has been thinking about “301s” for a long time—and doesn’t believe the U.S. should limit its response to China to actions that stay within the United States’ own WTO commitments. The last ten pages of his testimony lay out, I think, the strategy Trump is now pursuing—even if Trump is doing it with a bit of Trumpian flair that goes beyond anything Lighthizer specifically proposed. The third is Jennifer Hillman’s 2018 testimony [PDF] before the U.S. China Economic and Security Review Commission. She fundamentally disagrees with Lighthizer—Hillman, who has previously served on the WTO’s top court, believes the WTO process around China should be given a chance to work. Hillman recognizes the difficulties of using a set of “narrow” WTO cases to challenge China for specific violation of its WTO commitments. Instead she advocates a global challenge by the U.S. and its traditional allies that would include a case for “nonviolation impairment of benefits”– e.g. challenges to actions that frustrate the intent of the trade liberalization China committed to when it joined the WTO even if the actions aren’t technically violations of China’s WTO commitments. Such a case would lay the groundwork for the effective renegotiation of China’s WTO membership, at least if the threat that the WTO might rule against China in a "big" case was judged credible. All three articles are informed by a sense of disappointment that China’s WTO accession didn’t do more to transform the rules of the game inside China’s own market. Expectations that China would have to change, politically and economically, to succeed in the global economy haven’t been born out—as Ely Ratner and Kurt Campbell argued in Foreign Affairs. China’s Communist Party hasn’t been tamed by commerce. The Party-State still has firm control over the commanding heights of China’s economy—both directly, and indirectly, through its influence on large “private” companies (who can only remain both successful and private with the support of the Party). China has made it hard to invest in China in order to produce and sell in China if your firm isn’t Chinese. The evidence here is in my view somewhat stronger on the first complaint (it is hard to produce abroad to sell to China’s domestic market) than on the second complaint (China’s home market is reserved for Chinese firms). China’s imports of manufactures as a share of its GDP, net of the electronic components China imports for its electronics export industry, are actually quite small relative to its peers—and they are now lower, as a share of China’s GDP, than when China joined the WTO. And, well, in the sectors where it still imports, China is investing massively to displace those imports—whether of aircraft, semiconductors, or high end medical equipment. That's the core of what China used to call its Made in China 2025 plan. From China’s point of view, these are the sectors where China still is overly dependent on imported foreign technology. And in many cases, the policies that China deploys to support its efforts at import substitution aren’t WTO violations per se. Three broad categories stand out. And in all three cases, the policies “work” in part because of China’s massive scale. The first category is linking inward investment in China to technology transfer to Chinese firms. Foreign firms often believe that they have to invest in China to supply the Chinese market because of a mix of formal barriers at the border—in many sectors, China’s retains fairly high tariffs—and informal pressure to produce in China if you want to sell to China. China often tries to impede access to global (e.g. non-Chinese) supply chains if that’s needed to help create a Chinese supply chain. Plus, well, producing in China often makes economic sense, as wages in China are still relatively low and China has a diverse manufacturing ecosystem. China’s WTO commitments mean that China cannot legally require technology transfer as a condition for investing in China (see Hillman). Lighthizer’s 2010 testimony dug up a quote from President Clinton selling China’s WTO accession that hasn’t aged well (“We don't have to transfer technology or do joint manufacturing in China anymore”). But China has broad discretion to determine which sectors are open to foreign investment and which sectors are not, and it can condition approval of inward investment on forming a joint venture (JV) partner. Furthermore the JV partner (often a state company, given the nature of China’s economy) can condition its participation in the JV on technology transfer (the technology transfer in turn often helps the Chinese firm meet China’s goal of raising its level of “indigenous” innovation). In some sectors, this policy has effectively led foreign firms to transfer technology that led to the creation of an “indigenous” Chinese national champion. High speed rail is the most famous example. Firms that wanted to get a contract to provide high speed rail to China’s market had to enter into JVs with China’s state rail companies, and then into contracts that shifted the location of production of key parts to China. All this was possible because of competition among European, Canadian, and Japanese firms to get access to China's high-speed rail market, as the scale of China’s market was simply so big that no firm was willing to ignore it. China’s state is effectively the monopoly buyer of railway equipment—so getting access to the market effectively required technology transfer even if China didn’t have a written policy requiring it (to my knowledge, China’s activities here have not been challenged in the WTO). In other sectors, the “JV” requirement hasn’t led to the creation of an indigenous Chinese competitor. China has, for example, complained that the JV partners of GM, Ford, Toyota and Volkswagen have gotten lazy and haven’t done enough to build up their “indigenous” brands alongside the big international marks. But the combination of the JV requirement and tariffs have led to the development of a deep indigenous supply chain for autos—Keith Bradsher has reported that Ford’s Chinese supply chain now produces cars of comparable quality to its North American supply chain at a lower cost. And in sectors like semiconductors where China cannot put up tariff barriers to force production to locate inside China without putting its existing electronics assembly and component manufacturing business at risk, China seems to be resorting to other means to put pressure on firms to help Chinese firms upgrade their technology. Given China’s clear goals, there is always an incentive for foreign firms to form an alliance that puts them on the “right” side of China’s policy to become more technologically self-reliant. The second category is the availability of massive domestic subsidies. Such subsidies are allowed by the WTO. The WTO prohibits "export” subsidies (though you have to bring the case—no one has challenged the subsidies that Zhengzhou seems to provide Foxconn), but not domestic subsidies. Fair enough. Shifting too much sovereignty away from the nation-state through binding international commitments has given rise to problems of its own. Dani Rodrik among others has made the case [PDF] that the global rules shouldn’t be so binding as to preclude national economic policies/national economic development strategies. The WTO does allow countries to take action though to offset any “material injury” from imports that are linked to another countries’ domestic subsidies and also to seek relief from the “adverse effects” that another countries’ domestic subsidies can have in third party markets (though the dispalcement of exports is much harder to challenge in practice, as the “remedy” isn’t obvious—retaliation requires identify another sector that you want to tariff, and firms in that sector that rely on imports will complain). But, as Hillman notes [PDF], challenging China’s subsidies in the WTO is often hard (the “WTO’s Agreement on Subsidies and Countervailing Measures (ASCM) makes proving the existence of such subsidies difficult”). The WTO is meant to discipline explicit, sector-specific subsidies—the kind that have a budget line item. But in China, the nature of the economy means that in effect any firm that can borrow directly from the state banks rather than the shadow banking system gets low cost credit. Proving a sector specific subsidy can be difficult. Is steel more subsidized by the banks than solar? Or in electric vehicles, where China has allowed a thousand flowers to bloom? Is every state investment fund—for example the large funds set up to help finance the development of an indigenous semiconductor industry—a subsidy? How do you prove that when state firms dominate the economy? Here again China’s sheer scale matters. China doesn’t need to just subsidize a single national champion—it can subsidize credit to multiple competing firms (often in different provinces) and then finance the consolidation of the industry around the most successful firms. China’s banking system is so big—China’s domestic supply of savings is even more inexhaustible than the reservoir of labor in China’s countryside—that China can subsidize multiple sectors at once. The third category is the systemic impact of informal “buy China” policies that direct purchases toward domestic Chinese companies and force firms that want to compete effectively with the local, indigenous champions to make themselves more “indigenous” by producing more in China (ideally with a politically connected JV partner for protection). In part this is because China hasn’t signed on to the government procurement agreement. But the absence of WTO commitment here isn’t the only problem. The real problem is that in the capital intensive sectors where China has the most need for imports, large state firms are often the dominant buyer. In other words, the key preference comes from large state enterprises in their choice of equipment suppliers, not from the “direct” procurement of the central government. And as Wu notes [PDF], the large role of the “party-state”—with the Party selecting the leadership of key companies—means that informal guidance to “buy Chinese” has real impact (see the market share goals in Made in China 2025). In wind power, big contracts for wind farms come from the State Grid and other big power distributors. That limited the ability of European firms in particular to compete effectively for big contracts even when they set up shop in China—and allowed China to subsidize the creation of Chinese national champions in wind through the backdoor. The Chinese supply chains initially created to help foreign firms meet informal local content requirements helped too. The government’s power grid is also the ultimate source of demand for the firms that produce large turbines for coal powered generators, a market China now dominates. And I wouldn’t necessarily bet on GE getting a lot of contracts for the generators that will fire China’s growing stock of natural gas fired turbines. GE’s joint venture partner certainly looks also to be a potential future competitor as well, though no doubt GE has thought through this risk. China’s goals here aren’t a secret, even if China hasn’t yet replicated its success in coal-fired turbines. Rail of course is structurally similar, as the Chinese state through China’s various state owned rail companies is the monopoly buyer, but that sector has been discussed earlier—China’s various policy tools intersect. In telecommunications equipment, the big buyers are the state-owned telecoms firms. Their orders for indigenous switches and mobile base stations helped build up the “indigenous” Chinese firms—Huawei and ZTE—into major global competitors. And while cellphones are bought by individuals, the choice of phones offered by the big networks matter. Apple likely fears that it could get squeezed out of the Chinese market if the big carriers were pushed to do so…just as China’s tech giants are getting pushed to support China’s efforts to develop its own chips and cell phone operating systems . The structural barriers to an indigenous Chinese competitor to Boeing and Airbus in civil aircraft (and to GE, Rolls Royce, and Pratt and Whitney in aircraft engines) are large (see James Fallows). Yet the scale of the purchases of China’s own state-owned airlines still provides any “indigenous” plane with a captive market. The C919 may only compete with “old” A320s and 737s for now. But China’s ability to produce its next generation of aircraft (including a widebody) doesn’t really depend on the commercial success of its current generation of planes. No doubt there are other examples too, even if they aren’t as clear cut. Now Caterpillar’s Chinese operations want to get in on the Belt and Road action (including getting access to some Chinese tax rebates, which at least to my untrained eye, look a bit like export subsidies). This all matters, as construction equipment is one of the sector’s where the U.S. based producers historically have been very competitive globally—it is a big part of the United States' “indigenous” export base, so to speak. I personally believe that China’s system of domestic preference has a comparable impact on the U.S. economy to the technology transfer policies (and associated IP violations) that tend to get the most attention. China’s technology transfer has a mixed impact on the U.S. economy. It keeps U.S. companies from competing for some Chinese business, but it also reduces China’s attractiveness as an export base in some sectors (why share profits on sales outside of China with a JV partner). China’s domestic preferences encourage firms to produce in China even when it would be more economically efficient (as well as safer, from the point of view of managing the commercial risk) to produce outside China. Note that I haven’t focused on steel, or the internet platforms. The industries that use steel are in my view more important than the steel producers, and I don’t see any realistic way China will agree to hand over the data of China’s residents to the U.S. internet giants these days, at least not on terms that the U.S. would like. And I also haven’t focused on agriculture or energy—as these are sectors where China will import (from someone) no matter what. The sectors where technical knowledge is embedded in sophisticated production of specialized components strike me as the most important industrial policy battle ground. But, in the interest of being fair and balanced, let me close on a slightly contrary note. A country that discourages imports should in the end also export less—it should be less open overall. China 2025 implies that China's economy should eventually come to look more like Brazil—a country with a fairly closed domestic market and limited global export presence. As a result, the global impact of China’s import substituting policies—China’s industrial policy largely shifted from export promotion to import substitution after 2009—depends in no small part on China’s overall macroeconomic policy settings. After the crisis, China has, to a degree, offset much of the broader impact of its “buy China” policies through fairly loose macroeconomic policies (lots of off-budget fiscal stimulus, lots of credit) that have directed the bulk of domestic Chinese production toward the Chinese market, rather than the global market. This redirection of course isn’t complete. Even with a fiscal policy that the IMF considers beyond irredeemable, China still runs a current account surplus. And it is all relative—China has grown so fast over the last ten years that even if its exports are down as a share of China’s own GDP, they have grown relative to world GDP, and the GDP of China’s trading partners. But it does raise a point that the Trump administration should consider: from a global point of view, China’s overall policy settings could be worse than they are now…as the combination of domestic stimulus and the real appreciation of the yuan since 2006 have muted the global impact of China’s very real domestic distortions. ^ Airbus has set up an A320 assembly line in China to meet Chinese demand. It recently agreed to ramp up the pace of production in China. And, well China is still pressing for more. ^ I am not a lawyer and this is not legal advice, but I wonder if there is a WTO national treatment violation here—though any firm that brought the case would risk Chinese retaliation against its existing sales. ^ “Western solar companies say Chinese banks still lent heavily to the survivors despite low loan-recovery rates from the defaults of big Chinese solar companies like Suntech, Chaori and LDK Solar” (source). ^ China’s drive to create an “indigenous” construction equipment manufacturing sector did open up new opportunities for foreign engine manufacturers like Cummins—though that demand was largely met by Chinese production of Cummins engines, which created a supply chain that Cummins now uses globally. This shows up in the trade data: Construction equipment exports to China peaked several years back, while U.S. imports of construction equipment and associated parts from China have increased significantly (see the end-use data). 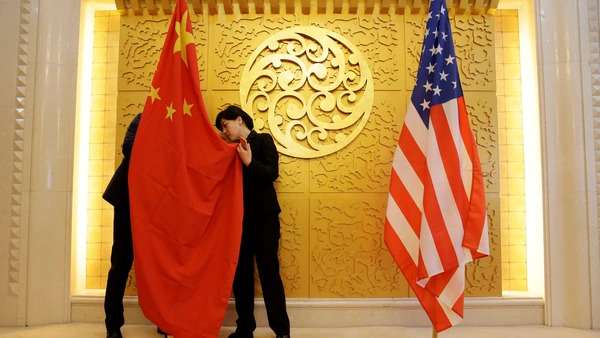 ^ I think Keith Bradsher got this right—the logical outcome of both Chinese policy choices and Trump’s policies should be a China that is less integrated into the global economy. The easiest way to get there? Further appreciation of China’s exchange rate.